Community services are a major part of NHS activity, with some 100 million community contacts taking place each year, ranging from public health functions such as school nursing and health visiting to assistance with intensive rehabilitation and chronic disease management. There's an ongoing ambition to transfer more health care from hospitals to locations closer to patients' homes, progressing from reactive care to proactive care and prevention. Skilled personnel, registering through a social care recruitment agency, use their expertise in their own particular field to educate the local community on improving their lifestyle. Their common goal is to create a healthcare system that doesn’t wait until patients become ill before it acts, but rather work to keep the population healthy. Risk-reducing behaviour can significantly decrease cases of preventable disease and chronic conditions. According to a survey by charity The King's Fund, there has been "significant progress" with care in the community, resulting in reductions in the length of time spent in hospital. In addition, care co-ordination programmes are flourishing particularly well at neighbourhood level, where engaging local communities is paramount. 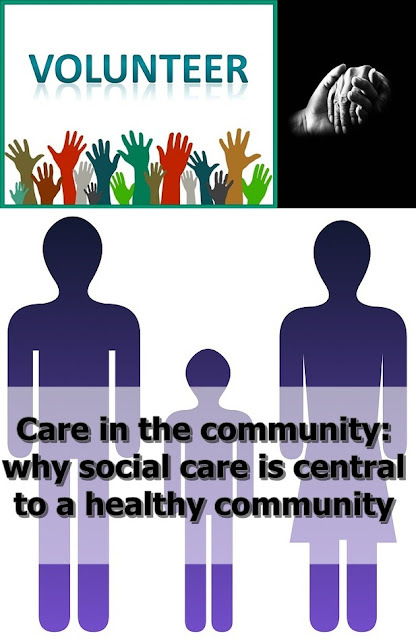 The aim of social care is to help people improve their health and general wellbeing, based on a local need and varying between areas. Some of the issues tackled by social care in a proactive manner include smoking, eating habits, physical activity, sexual health, alcohol and emotional wellbeing. The government's vision for care in the community, explained in its 2012 White Paper, Caring for our Future: Reforming Care and Support, outlined the benefits of social care. Two core principles were identified. The first was to postpone and prevent people's need for formal care by keeping them healthy and out of hospital through social care. The second was to change society's perception of people with care needs, recognising they had a lot to offer and ensuring they could live life to their full potential.